Here is a list of different events at which I have played. I have tried to answer the most common questions that are asked when I book an event. At what types of occasions have you played? How much does it cost to have a piper play? The fee for a piper is based on how long the piper is needed and how far the piper has to travel. The initial fee will be based on a 1-hour minimum of the piper’s time, which may exceed the actual playing time. Traveling expenses will be included in the initial hour. A fee per half hour will be charged for the client who chooses to have a piper for a longer time. The pricing for funerals can be a little different from what is mentioned above. Cash or check is accepted only. When does the piper play? I always ask: Do you have anything in mind? If you do, lets do it! What is normally played at a wedding? Keep in mind the tunes that are mentioned below are only suggestions and other tunes can be played if one does not like the sound of the tunes. There are many times when a piper plays to greet people at the door prior to the start of the wedding. A medley of tunes is usually played for the guests. Many of the tunes that I play can be played for any part of the wedding. I often interchange them depending on what the bride, groom or even mother-in-law likes. I sometimes use the same tunes for different parts of the wedding ceremony. These are tunes I have played for weddings and have found they add the right touch to a beautiful ceremony. Processional: A wide variety of music can be played on the pipes from traditional Scottish airs to the sound of beautiful hymns that soar in the air, penetrating even the hardest of hearts. Scottish music like "Lord Lovett’s Lament", "Suo Gan", and "Scots Wa Hae", can be played in a medley along with "Ode to Joy", "I love You Lord", and even "Amazing Grace" to start the beginning of the bridal entry. Mothers and grandmothers being seated: Can be the same as above. Some people have just had me play "Amazing Grace" as they were being seated Bride and Bride’s Maids: I will include these together because the music can be interchangeable. Traditional music like the "Bridal March" and "Trumpet Voluntary" can be played as the bride/bride’s maids walk down the aisle. For a nontraditional wedding, the bride may process to the sound of "Highland Cathedral". "Highland Cathedral" is very powerful with the accompaniment of a pipe organ. I do have the music score available if desired. I have played music for the groom to enter as well. Unity Candle: A beautiful hymn or a slow Scottish Air is appropriate. Recessional: I often recommend a piper walking down the aisle, greeting the bride and groom, and then leading them back down the aisle. "Scotland the Brave" or the "Bridal March" both work well for the exiting of the bride and geroom. Some people like a jig played or even "Marie’s Wedding" for the ending of the celebration. As People Leave: The piper can play for the guests as they leave. I usually keep this very upbeat unless told otherwise . 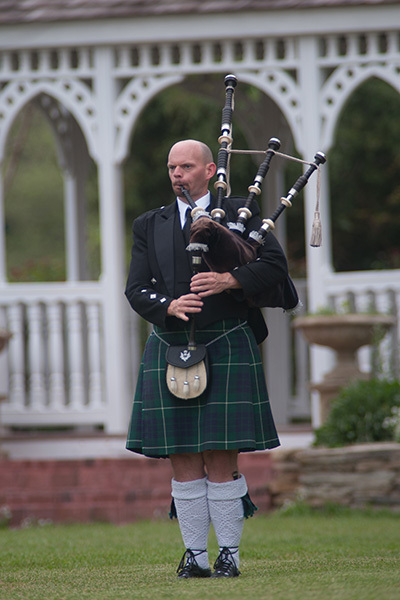 Reception: A surprise to the bride, groom or family members could be to lead them into the reception area without them knowing a piper is going to be there. Playing as the guests and wedding party enter adds a beautiful touch as well. These are the most common questions that are asked about what music is played at a wedding and at what point during and after the ceremony the piper plays. Any other ideas are welcomed. Where does the piper play during a funeral service? The piper can play at the church, graveside, or both. Is there and extra charge to play at the church and the graveside? Yes, I charge extra for the drive time that it takes to go from one place to another. That will depend on how far the graveside will be from the church. What does the piper play at a funeral? The piper can play for the funeral service at any time a person likes. Because the Highland Bagpipes have only 9 notes, some hymns or other music cannot be played nicely on the pipes. I have recorded some hymns that sound beautiful on the pipes and may be appropriate for a funeral. Most commonly a piper plays "Amazing Grace" at the closing of the graveside service. Leading the casket up to the lowering device, or just playing as the casket comes up adds a special touch to the service. Do you play for schools or church functions? Playing the pipes for students is a great way to introduce them to the history of the pipes, how they work and the different types of tunes that can be played. I offer a hands-on, interactive presentation that will give learners the opportunity to see, hear and touch an ancient instrument that touches the heart and soul (Suitable for small groups of 24 or less). For St. Patrick’s Day I have marched up and down aisles in school while the students line the hallways to hear the pipes. What are some of the music selections I can choose from? View the Songs page to hear a large variety of music I can play for events.